Every time I go to Intrigue Nightclub, I like it more and more. It’s a boutique club that’s a welcome change from the mega-clubs. But what’s really cool about Intrigue is its total sensory experience with water, fire, award-winning sound and one of the most beautiful indoor/outdoor settings on the strip. Perhaps not surprising though is that Intrigue is often overlooked as a club choice. It just seems to get overshadowed by the other Wynn properties – XS, Encore Beach Club, and their nighttime pool parties. But, in truth, this club is a gem. There are just so many unique things about it as compared to the other Las Vegas nightclubs. I’ll get into more detail later, but here’s a quick spoiler. Intrigue makes our shortlist for best bang for your buck clubs, it has the most fun video booth on the strip, and you get to see top DJ talent which is impressive considering Intrigue’s size. Did I pique your interest? I hope so. By the time you finish reading today, I’m betting Intrigue is one club you’ll add to your clubbing list. But, before we begin, if you’d like bottle service at Intrigue Nightclub, please text us at (702) 816-6738. You can also reach us at info@vegasprimer.com. Intrigue is elegant and sophisticated. It’s part of Wynn, after all. It’s also one of few clubs in Vegas with a real indoor/outdoor experience. And, it’s not just any outdoors either. Intrigue features a 94-foot waterfall cascading down a mountain into a pond below, three fountains with pyrotechnics and a state-of-the-art sound and lighting system. There’s even a bar that’s carved out of the rock. And, you’ll enjoy a considerably different VIP experience here as well, one that may just include pizza. Intrigue is inside the Wynn hotel. Head to the main entrance of Wynn, go past the front desk and turn right. Entry to the club will be immediately on your right. If in doubt, look up. You can’t miss the sign. The dress code across all clubs in Las Vegas is mostly the same. But, as Wynn is a more upscale hotel, it never hurts to dress up even more here. For guys, we recommend collared shirts with slacks or nice jeans and dress shoes. No t-shirts, shorts, baggy jeans, hats, sneakers or sandals. Also, don’t wear any clothing that displays sports teams. For ladies, we recommend a dress and heels. Rompers are also okay as are a nice pair of pants (including jeans) with a cute top. If you can’t wear heels, any dressy flat will work as well. Don’t bring any selfie sticks, weapons or drugs of any kind. Even if you have a prescription, if you don’t need it, then don’t carry it with you. It’s just not worth the hassle. The 2018 ticket prices for Intrigue Nightclub are as follows. Vegas Primer Tip: If you want to go the general admission route, buy the “General Admission + Drink Ticket” option. For only $5 more, it’s well worth it. You’ll save up to $15 by doing this as drinks are expensive! To get into Intrigue for free, you’ll want to get on their guest list. The current rules for the guest list are listed below. Please note that these rules may be subject to change without notice. Ladies: Free entry before 1 am. On certain nights, drink tickets are given out. Guys: Free admission before midnight but you must have at least an even ratio of guys to girls. If you’re coming to the club with an all guy group, or with less than an even ratio, it’s best to buy general admission tickets. 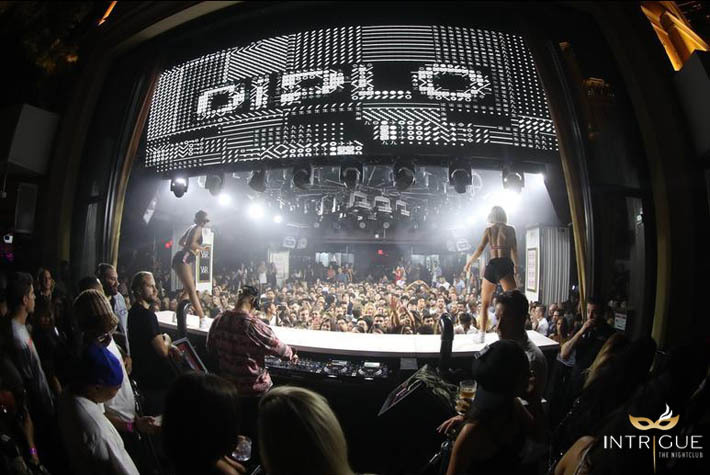 Vegas Primer Tip: It’s important to remember that you must be on the guest list to take advantage of free entry. You can’t just walk up to the club and ask. We recommend making your guest list reservation no later than 6 pm on the day you wish to attend. To find out more about bottle service at Intrigue nightclub, feel free to text us at (702) 816-6738 or send us an email at info@vegasprimer.com. Overall, bottle service at Intrigue is moderately priced. If $$$$ is the most expensive club, then Intrigue would be around $$$. On most nights, bottle service pricing starts at $600 and goes up to $4,000 for the best table in the club. The price you pay for bottle service depends on four factors. The closer you are to the DJ, the higher the price will be. If you exceed the maximum allowable number of guests for a table, the more it will cost you. The more popular the DJ, the higher the minimum. If it’s a holiday weekend, expect prices to be at least 1.5x more than on a regular weekend. What if I have more people in my party than the table allows? This is an excellent question and one that gets asked frequently. In most cases, the club will make you increase your minimum to accommodate the extra people in your party. For instance, let’s say you have 15 people in your party. If you wanted to book a lower dance floor table on a big night, the price is $3,000 for up to 10 people. Since you have five extra people, the club will make you increase your minimum to $4,000 to get the same table. Now, this rule only applies at the walk-in. If you meet people inside the club, you can ask them to join your table without fear of the price going up even more. All this said, we can help you avoid increased minimums, even if you have a large party size. Call or text us at (702) 816-6738 for bottle service pricing for the dates you’ll be in town. Bottle service prices are quoted regarding a minimum spend amount. For instance, if you want to book a back wall table, a host will quote you a minimum amount, such as $2,000, and may not say anything further. Although this is the minimum spend amount required, it’s not how Mike and I quote prices. We want you to know the total cost you’ll pay so there aren’t any surprises. To calculate the final cost, you’ll want to add the tax, tip and service fee to the minimum quoted. A good estimate is approximately 35%. (All Vegas clubs charge these fees so you can add the same percentage to any bottle service quote.) So, taking our example, the final cost would be $2,700. Here’s the calculation. Although 35% may seem quite high, the percentage does include the tip. This means there’s no additional tip necessary. Even if the club has a separate line for a tip, you can leave it blank. You’re already paying it. Below is the table map for bottle service reservations at Intrigue nightclub. We’re providing this floor plan for informational purposes. Table numbers may change at the discretion of the club. Also, although we’re identifying table numbers here, Intrigue is unlikely to guarantee a specific table number with a bottle service reservation. Instead, they’ll reserve a table within a particular section for you. For example, if you want table 33, your reservation will be for a dance floor table. You can certainly put in a request for that table, and you may get it, or they may seat you at table 32 or 31 or 34. It’s up to the club. If you want the absolute best table locations, choose tables 31 – 34. These are on the dance floor, have exceptional views of the DJ booth and the outside area. Expect these tables to run in the $3,000 range. Also, we’re big fans of table numbers 43 and 44. These are second tier tables (upper dance floor tables), in the middle of the club. They border on the hallway leading to the dance floor, so you’ll get a continuous flow of traffic and action. If you want the best combination of table location and price (what we refer to as “value”), check out any of the upper dance floor tables. These are table numbers 41 – 66. These tables are elevated and offer great views. Sure, they’re not on the dance floor, but they’re still close. And, they’re substantially less than any of the dance floor tables. For example, getting a bottle service reservation here may save you $1,000 or more as compared to a dance floor table. For a few feet difference, it just might be worth it. If you want the cheapest bottle service option at Intrigue Nightclub, get a table on the patio or inside the club along the back wall. The outdoor patio tables start at $600 whereas the back wall tables begin at $1,000. I don’t know if I’d say there are any undesirable table locations at Intrigue Nightclub. I think it comes down to more of what type of experience you’re seeking. For example, if you want a more intimate setting and a beautiful view to celebrate with your friends then an outdoor table might be perfect. But, if you’d like to be close to the dance floor an outdoor table will be disappointing. You’ll want an upper dance floor or dance floor table instead. We can help you determine what table location is right for your group. I will say though that there are a few tables at Intrigue that have a wall in front of them making it difficult to see the DJ. These are the only tables that I have some hesitation. For more information about which tables to avoid including specific table numbers, email us at info@vegasprimer.com. You can also reach us at (702) 816-6738. Feel free to text or call. Below is Intrigue Nightclub’s Bottle Menu. We’re providing this menu for informational purposes only. Please note that offerings and prices are subject to change without notice. Also, in addition to the selections below, Intrigue offers Red Bull, Fiji water, and a wide range of individual drinks. There’s also a small wine menu too available upon request. At times, Intrigue offers bottle service packages or specials on individual bottles. Here are examples of some they’ve provided in the past. For Intrigue bottle service packages or specials for the day you want to attend, email us at info@vegasprimer.com. You can also reach us at (702) 816-6738. If you’ve been to clubs in Vegas before, then I’m sure you’ve seen a group of cocktail waitresses with signs and lights making a big deal at a bottle service table. These are known as bottle service presentations. And, if you get one, they’re guaranteed to have everyone in the club watching you. Presentations range from LED lights that look like sparklers, to large-scale emojis and signs. There are sweet ones too such as birthday cakes or chocolate covered strawberries. At times, presentations get even more elaborate with costumes. If it’s a special occasion, we can help you create a custom presentation as well. Nothing is off limits. To get a presentation, you’ll have to either meet a certain bottle service minimum or buy a bottle expensive enough to qualify. To find out what these minimums are for your night, give us a call or text us at (702) 816-6738. You’ll want to plan for a comp table. A few days to a few weeks before arriving is always a good rule to follow. We recommend reaching out to an Intrigue VIP Host (you can also contact Mike and me). I want to emphasize again that comps may not last all night. The number available is limited as well. And they’re not offered on every night a club is open. Additionally, comps are never guaranteed even if you’re told by a host or a promoter that you’ll be joining a table. These are freebies that clubs give away from time to time. They can change their mind, or if the club sells out, they won’t be offering any comps. That’s not to say though that comps don’t happen – they most definitely do because we get them for our clients frequently. Lastly, since it’s free, please don’t be too picky about a comp table. For instance, XS is going to be a lot more challenging to get a comp at than Hyde or Light. If you want free, you need to choose from what’s available. Also, although it’s a complimentary table, you’re still expected to tip. $100 per bottle is the standard. So, for example, if you have a group of five ladies then each would contribute $20 per bottle. Intrigue stands out from the other nightclubs in Vegas in many unique ways. I want to give a big round of applause to Intrigue for this one. I’m sure a lot of us have had nights at clubs where we’re beyond starving but don’t want to leave because we’re having too much fun. Lucky for us late-night snackers, Intrigue did something about it. On some nights, if you’re a bottle service patron, you may be in for a big surprise. Intrigue is known to bring out pizza to the tables in the club. Sometimes they do this for all tables. Other times, it’s only for select ones. (Opt for any of the dance floor tables for your best chance of scoring pizza.) And, the best part – it’s free. Mike and I get asked a lot about which clubs offer the most value for the money. And Intrigue makes the cut. It’s one of our recommendations for best “bang for your buck” clubs. Here’s why. DJs are shared across Wynn properties so not only will you get to see top performers at Intrigue, but you’ll get to see them at lower prices too. You can save a lot – sometimes even $1,000 or more by merely going to Intrigue instead of XS. Diplo, RL Grime, Cheat Codes, Marshmello, and Afrojack (to name a few) all perform at Intrigue. Intrigue has the most exclusive club-within-a-club in Las Vegas. It’s called The Living Room, and it’s hidden inside Intrigue nightclub. To get access, you have to be invited in, and if you’re one of the lucky few who makes it inside, you better stay off your phone. It’s a social media free zone. At 1,200 square feet, this club is a stark contrast to Intrigue’s main room. And although the main room can be seen through the two-way mirror behind the bar, The Living Room features a different DJ. You’ll hear vintage tracks in here all carefully selected from a collection of 1,000 vinyl records. Intrigue has one of the best industry night parties on the strip. For those of you who don’t know, an industry night is when Vegas locals who work at clubs go out and show their support for a different club. Yes, even a competing nightclub. You can read more about industry nights here. In short, industry nights are crazy parties that offer exceptional savings on bottle service reservations. You’ll still get the top DJs and also get to party with some beautiful locals as cocktail waitresses and VIP hosts are frequent attendees. For more information, email us at info@vegasprimer.com. If you’re a girl and you’re on Intrigue’s guest list, you’re going to love this. You might get free entry into XS Nightclub too. This especially works well on Chainsmokers nights at XS. For example, an Intrigue VIP host will walk you over to XS before the Chainsmokers take to the stage. As long as XS isn’t at capacity, you’ll get right in. By spending your early evening at Intrigue, you’re more likely to get freebies like girl comp tables and drink tickets, and you still get to enjoy the Chainsmokers. It’s a win-win. Intrigue is now the third newest club in town, opening in 2016, just a month ahead of Jewel club Las Vegas. It shouldn’t come as a surprise then that the venue is in pristine condition. Intrigue was previously Tryst nightclub before transforming into Intrigue. But nothing from Tryst remains (except for the waterfall). The entire place has been gutted and remodeled to the highest Wynn standards. Even the color palette of gold and cream screams high-end. From the booths to the floors, Intrigue Nightclub feels clean and modern. And for bottle service guests, the club even features drawers beneath the seats, so ladies have a place to stow their belongings securely. Feel free to hop up on the booth and dance too. It’s entirely okay to do so. With the newness, comes another advantage – technology. You’ll find one of the biggest LED screens with graphics choreographed to each DJ’s performance. And with 110 decibels inside, Intrigue has one of the best sound systems around, designed by John Lyons. We don’t talk too much about dancers at nightclubs. At some clubs, they blend into the background, but at other clubs like Drai’s or Intrigue they stand out. Although Intrigue’s dance shows are short, they’re quite impressive. You’ll see a burlesque-style performance nightly on top of the main stage. Intrigue has one of the prettiest outdoor areas for a club in all of Vegas. Like I touched on earlier, there’s a waterfall, a pond with fire, and chandeliers hanging from the trees. And if you want to grab more drinks, there’s no need to wander back inside. There’s an outside bar next to the waterfall. But even from inside the club, you’ll still get a fantastic view of Intrigue’s outdoor experience thanks to the floor to ceiling windows behind the DJ booth. The setting is one of our favorite features about Intrigue. It’s true that many Vegas clubs have video booths inside their venues. But, for some reason, I’ve never noticed them at the other nightclubs. At Intrigue though, the video booth takes center stage. As you transcend the staircase into the club, you’ll immediately notice the bright lights illuminating the video booth. We highly recommend taking a few videos before you go inside the club. My friends and I were once there for over 30 minutes (we let others cut in, of course). It’s that much fun. You can take as many videos as you want and you’ll get copies straight to your email for posting on social media. Just remember to get back in line after you shoot one so that others can take their turn. Well, that wraps up our ultimate guide to Intrigue Nightclub. If you have any questions, please don’t hesitate to reach out. We’re always happy to help. You can get in touch with us via email at info@vegasprimer.com or call or text us at (702) 816-6738. Due to the volume of inquiries we receive, we can only respond to requests for Intrigue bottle service price quotes and reservations. We’ve included all of our general club information in this article. Thank you!